I�ve always been insecure about divulging my age on the internet, particularly within pieces of writing that I publish on the Internet. When I�m discussing the ins and outs of videogames across various outlets on the worldwide web, I often feel as though my opinions don�t matter because of my relative youth, and any inexperience that might come with it. The truth is, I think about videogames for most of the hours that I�m awake. When I�m not playing them, I�m writing about them. When I�m not writing about them, I�m daydreaming about them (much to the detriment of my social and academic lives). Videogames are my favourite art form. I am of the opinion that games provide us with a form of entertainment like no other. A combination of music, cinematographic techniques, literary devices, art and gameplay, games combine every other artistic medium with their own to create experiences that feel like a digital banquet of art and creativity, experiences that feel a lot like film, literature, music etc, but with an added dose of uniqueness that sets them apart from the pack. 1. 1.Videogames could now do Star Wars better than films could. 2. 2.Videogames could excite, entertain and mesmerize me more than any other art form previously had. You see, the main reason I love videogames is because of the universe�s in which they are set. I like to imagine that the game I am playing is just a series of self-contained events set within a grand universe; a universe with infinite stories to tell. Games allow us to experience (the word �experience� is probably starting to annoy you now, but please bear with me) these universes in a way that no other art form can. We are not restricted to a filmmaker�s camera or an author�s pen. If I, the player, wants to walk over to an NPC to see what it is they�re doing, a game allows me that luxury, at no expense to (and often to the betterment of) the game�s narrative. Unfortunately, the past few years have not been kind on universes. With the exception of a few stand-out titles, very few games have presented me with universes that I want to be a part of; universes wherein the simple, passive act of being there is enough to entertain me. Whilst these games might entertain me thoroughly and provide me with significant hours of fun, they tend to lack the unique spark that was responsible for beginning my love affair with videogames. Too often nowadays are players led through corridors and linear events, denied the ability to freely explore a universe and examine each individual, wonderful detail it provides. I had begun to wonder if the games industry had become so corrupted by the almighty dollar that they might never truly capture my imagination again. 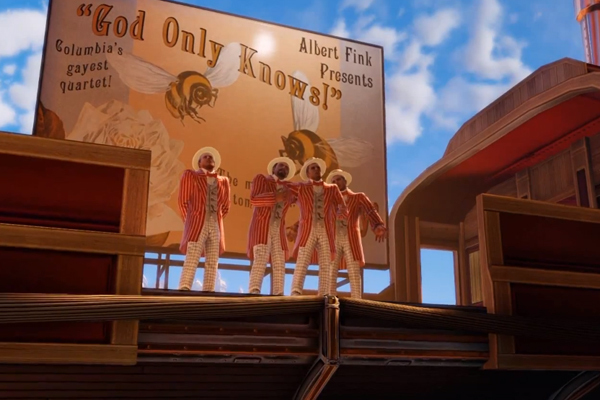 Then along came BioShock Infinite. 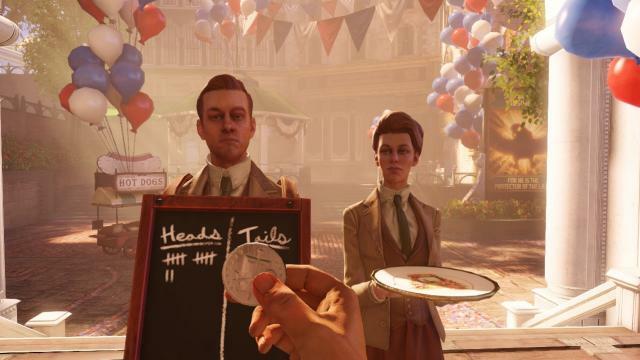 Every frame of BioShock Infinite is filled with minuscule details that don�t detract from the game�s narrative when gone unnoticed, but provide us with wonderful titbits of exposition, rhetorical questions and character/world development. The sheer attention to detail implemented by Levine and Co. only became evident to me after the game blew my mind for a second time. These details help to make Columbia, and by proxy, the rest of the BioShock universe(s) and entertaining world to be in. Even during the more linear sections of the game, Infinite stands out as a game that employs other art forms to increase its entertainment value and narrative power, but in the end tells its story in a way that only a videogame can. Take, for example, the elevator sections throughout the game. Just by peering out of a window, the player can see so much of Columbia; so many fine details regarding architecture, fashion, characters, ideologies, technology. Purely by giving the player the ability to move Booker�s head around, these scenes give players a sense of agency within the game�s narrative that a film or book cannot even hope to achieve. When Booker peers out over the decadent cityscape of Columbia, it is as though I am seeing these things; I am preparing to leap from this elevator, hug the clouds and shout �I hate racism!� What would have turned up as a slow, descending/ascending tracking shot within a film becomes so much more powerful and dynamic within a videogame. Let�s not forget, many of Infinite�s greatest moments are the times Booker spends wandering around on the beach or wading through punters at the fair. These moments of exploration, along with the game�s voxophones, kinetoscopes, and other such interactive devices (the Duke and Dimwit machines in particular were eye opening and unique) provided me with a sense of background detail and exposition that once, again cannot be portrayed in other mediums. I felt like I was being rewarded for exploring what was already an astonishingly beautiful-yet-tragic world. Independently of Booker and Elizabeth�s quest, some of the game�s finest stories are told in such a way, often over the course of about ten seconds or so. Think about the voxophone that tells the story of a woman whose husband has been diagnosed with cancer, and must sell his body and become a �Handyman� in order to survive. As well as �Bring us the girl and wipe away the debt�, I think �better a Handyman�than a dead one� is one of the most tragic and memorable quotes that the game has to offer. All of these devices and scenes provide so much information and detail that simply existing within the game�s universe becomes a source of entertainment. Playing BioShock Infinite brought me back to the days I spent as a child fantasizing with my friends about becoming a Jedi, slaying orcs and defeating super-villains. Ken Levine and co have not only created a living, breathing universe that encapsulates the true spirit of imagination and creativity that I�ve missed for so long, they have reminded me why I love videogames. I love videogames because they allow me to escape into another world, a world that feels so familiar to our own, yet so different. A world so full of danger, wonder and excitement, that it takes all of my effort not to spend all of my time within it. Ken Levine has reminded me of these things, and in doing so, he has reduced me to my five year old self, gleefully experiencing Star Wars for the first time in a dusty Lincolnshire cinema.